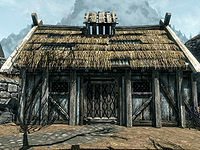 Heimskr's House is a small house in Whiterun owned by the priest Heimskr. It is located beside the Gildergreen tree, between Jorrvaskr and the Temple of Kynareth. It consists of one area, Heimskr's House. During the Battle for Whiterun rubble lands in front of the house, making it impossible to access the house for the rest of the game. Heimskr will then be forced to move to a small camp near Jorrvaskr, or be thrown into jail if you sided with the Imperials. 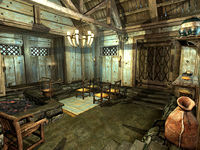 The house is small and bare-bones, although four chairs facing a homemade podium on the northwestern wall suggest that Heimskr doesn't only preach near the Gildergreen outside. Next to the chairs is a cooking pot, while a total of five leeks can be found near the front door. To the southeast is Heimskr's bedroom which contains a chest with a few gold coins and a small dinner table dressed with some sliced eidar cheese, a bottle of wine, and a potion of vigorous magicka. The owned bed stands along the northeastern wall, while a dresser with clothes has a bottle of ale, a goat cheese wedge, and a potent lingering poison on top. The front door has a novice lock, the key to which is carried by Heimskr. There is an "Empty" shadowmark to the right of the entrance door, even though the Thieves Guild considers his house to be a wealthy house. The house will not be empty if you are sent here on one of Vex's thievery jobs. If given a Thieves Guild radiant mission with Heimskr's house as your target location after the Battle of Whiterun, it will be impossible to complete the objective due to his house being inaccessible. You may simply return to the questgiver and quit the current job without any penalties. Another possible fix is to type coc WhiterunHeimskrsHouse into the console to get teleported inside Heimskr's House. To get back outside, you can simply use the door of the house. This page was last modified on 3 June 2015, at 18:18.